After a lot of frustration and anger, the machine worked. I had been really angry frustrated. At one point, the hammer you will see in the video post kept falling over. Not only that, but the jenga blocks weren’t touching the ball. But after we fixed that, one try turned into the final test. My mom was filming me and I started it. As usual the machine did the steps, one by one, then knocked over the egg and into the bowl. I jumped around, then went to check the egg. It was cracked even more!!! ( We did a no film test and the egg rolled off but I didn’t know it was cracked. ) So we were really happy that it finally worked!!!!!!!!!!!!! I had a really hard time with my Rube Goldberg today. Since Olivia wasn’t here, I had to finish it, which was hard. A lot of the fails were the same: not hitting the Jenga blocks, the hammer going in the other direction. So a lot of the time I would get really frustrated at how much it didn’t work. It was really hard to keep going when all you had in front of you was fails, fails, fails! Elliott was right. It does take a lot of time AND effort. Olivia came over today. The Rube Goldberg had some flaws in it.. First, we tried different balls and some of them rolled off the open tube. Then some didn’t hit the jenga blocks at all. Then we came to a new solution to try a limited amount of different balls, like a marble, a black ball, two bouncy balls, and two golf balls. Since we didn’t have any eggs either, I got a plasic egg and filled it with change and put it in the ramp. When we tried, again and again the ball didn’t hit the jenga blocks. Then the ball hit it but the jenga blocks didn’t move. Then we added a basket that was connected to the jenga blocks with a ball and hammer, for two more steps, and also added a Steve toy falling onto the egg which would stay in the bowl. But after we added barriers surrounding the top base of the chute, the ball didn’t work, and a couple of times the ball didn’t hit the hammer. So we had the same tries going the same things wrong until…the ball rolled down and knocked the first few blocks down like before. UUGHHH! I thought it would never work! Now we have at least nine or ten steps, and some success. Rush’s dad came in to talk to us about what he does. He worked for Justice Alito on the Supreme court. He said that he had handled many cases. In that bunch, he handled some family cases and at one time after the Supreme court, I think he handled many family cases at family court. He had been invited to some great get togthers at the courthouse. One of the interesting and funny things he said was that “the highest court in the land was a basketball court above the main court room. 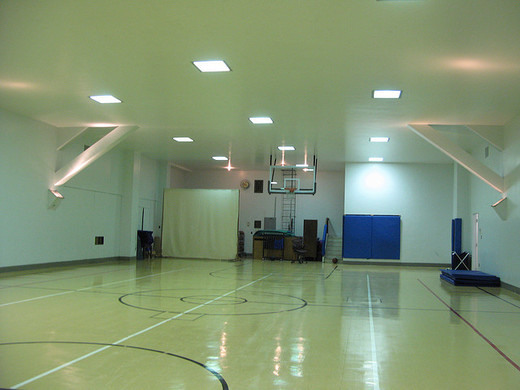 Only there was no playing while the court was in session. He playind there a lot when he was there. For the activity, he gave us questions about the justices. When me and Olivia and Elliott turned ours in, we got the prize: a pamphlet of the supreme court and the constitution.
. The Highest Court in the land!!! There is a new series of blog posts AND books called: THE EYE OF THE DIAMOND! There will be three books, and three series of posts following THE EYE OF THE DIAMOND BOOK 1. This new series is coming out on FEBRUARY 1st, 2017! Stay tuned!!!!!!!!!!!!!!!!!!!!!!!!!! For expert lecture 6 Jonah’s mom came in to talk about genes. We did a family tree for Harry Potter and STAR WARS. Harry potter was really big because Sirious black has a brother that died and then he died, and Harry was connected to him because they were friends, and Harry dad’s brother takes care of him now but then Harry got married to Jinny and they had three kids, and Ron married Hermione and they had two or three kids. Then for STAR WARS Annikan married Padme and had Luke and Leia, Annikan and Padme died and then Leia married Han Solo and had Ben Solo and then Ben turned into Kylo Wren. So basically, Ms. Hopkins wants to find out why someone died in families, or if anyone in the previous generation had cancer and passed it down because someone has cancer and is in the hospital that is in that family. Like in WONDER, Via and August have the same genes, even though Via doesn’t have a deformed face like August. So that means that if both of them have children, Via has a 50-50 chance of her kids have a deformed face, and August has something like a 75-90% chance of his kids have a deformed face. She is currently studying the genes of ancestors of families. Last night I was working on the detailed sketch for the egg cracking Rube Goldberg. Here is the sketch. Note that all the materials are includes and labeled. 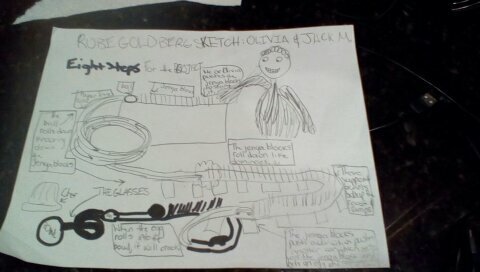 Sketch of Olivia and JackM: The Machine has Eight steps: a hand hittting the jenga blocks, Jenga blocks hitting the ball, the ball rolls down the ramp and into some more jenga blocks, then the blocks hit a car which hite another car, in which that hits more jenga blocks and then the egg rolls in to the bowl. Olivia and I are doing a Rube Goldberg that will open a drawer. There is a set of drawers and the 4th one will be opened by a string attached to a piece of cardboard. We will need something heavy to open the drawer, like a basketball or a heavy rolling object. It will require some force to open the drawer, so that is why we will need something heavy to push the object heading in the direction of the string and cardboard. I think we should use some inclined planes and Jenga blocks or dominoes to move or push the object that will pull open the drawer. We have already started our sketch for the project. Olivia and I have changed the drawer opening to an egg cracking Rube Goldberg. Here is our materials list. PAPER TOWEL ROLLS- These will be used for the ramps/inclined planes. EGGS- For our fails and succeses. JENGA BLOCKS- Used for dominoes. SMALL BALLS- These will hit the jenga blocks and eggs. SMALL HOT WHEELS CARS- These will hit each other and the jenga blocks. BOWL- Will crack the egg when it hit the bowl. 1 HAND- To start the machine. CARDBOARD- It will be used for roads for the jenga blocks. FOAM BLOCKS- These will be used for supports. The reason why I wanted to change it was because we really couldn’t find a way to continues the steps for opening the drawer. It would also be much harder and wold be hard for us to come up with the object the actually opened the drawer. This way, the egg would be not so complex and wouldn’t require a lot of force to have.